All this talk of future commercial airplanes rings with echoes of the past. Of course the 1940s’ Horten and Northrop flying wings are well known. 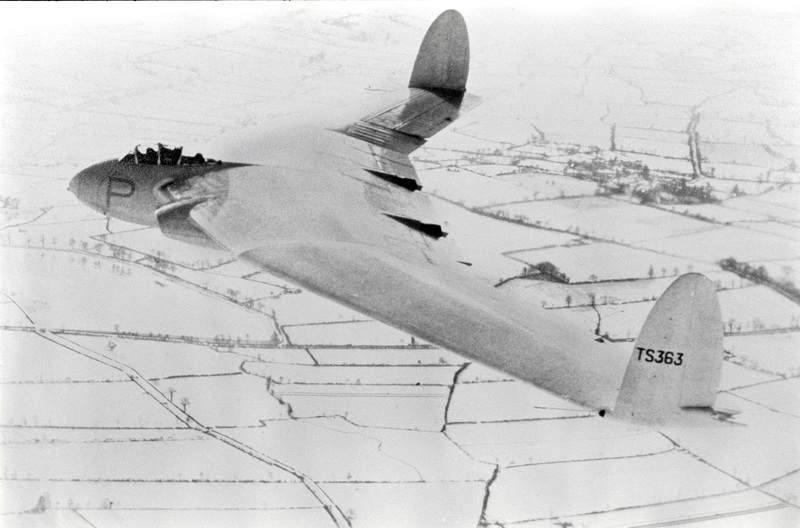 But Britain was pushing on the technological ceiling at the same time – with their Armstrong Whitworth A.W.52. The smooth, white surfaces of TS 363 blend into the snow covered Warwickshire countryside, during a sortie out of RAF Bitteswell. While not a true flying wing (it had vertical surfaces at each wing tip for yaw control) the A.W.52 was as advanced – and visionary – as anything else in the world at the time. The A.W.52 itself was only to be a stepping stone towards a larger commercial jet with a maximum takeoff weight in the order of 200,000 lbs. To give the original vision some context, that’s a flying wing jet airliner in roughly the same weight class as today’s B737 family – and before 1950! The cutting edge features of the A.W.52 included its tailless configuration and pure jet propulsion, plus 35º wing sweep-back; an airfoil designed to maintain laminar flow to 55% of chord; boundary layer control over the control surfaces; automatic pitch change correction, thermal de-icing, separately steered nose wheel, fully pressurised crew compartment, and a Martin Baker ejection seat (the first ever used ‘in anger’ in the UK, as we’ll see). There were also Fowler flaps on the inboard wing section, spoilers on the outer wings, and ‘elevons’ for combined roll and pitch control. 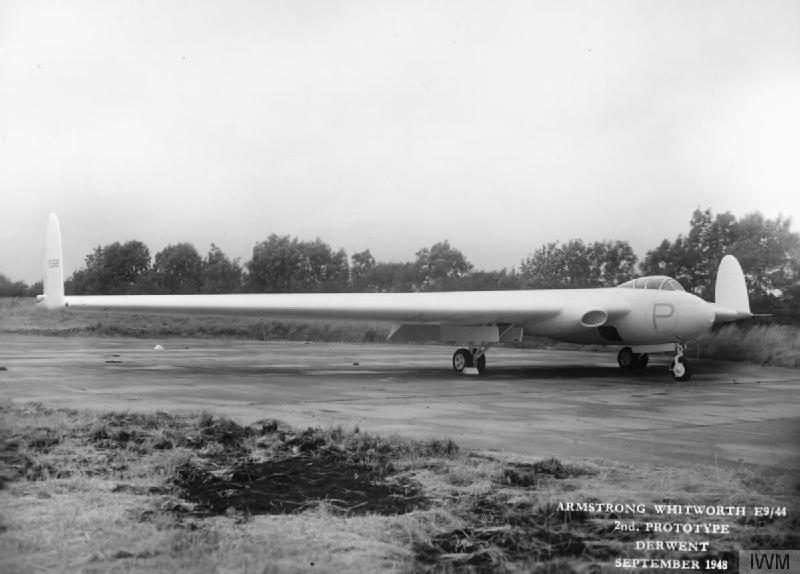 Armstrong Whitworth began design and wind tunnel testing on their flying wings in the early 1940s. By May 1943 they had enough data to start designing a scaled wooden glider as their first test bed. 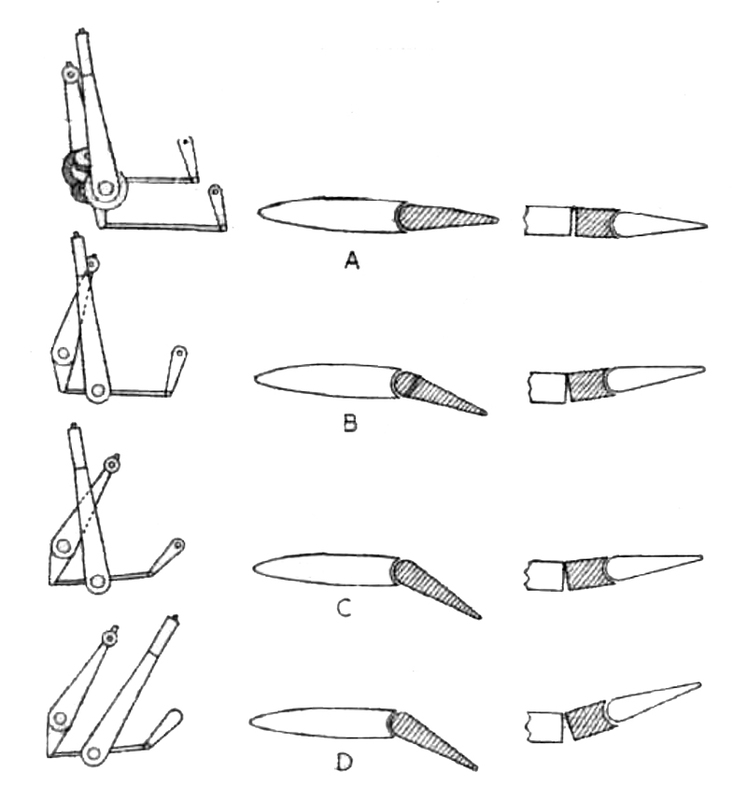 A diagram from Flight (Dec 19th, 1946) showing the interaction of flap and corrector control, flap position and corrector response. Construction began in March 1944 and on March 2nd, 1945, the aircraft was towed aloft for its first flight. With a wingspan of 53 ft 10 in (16.41 m) the glider was used to establish general flying and low speed handling characteristics, with a typical tug release height of 20,000 feet. 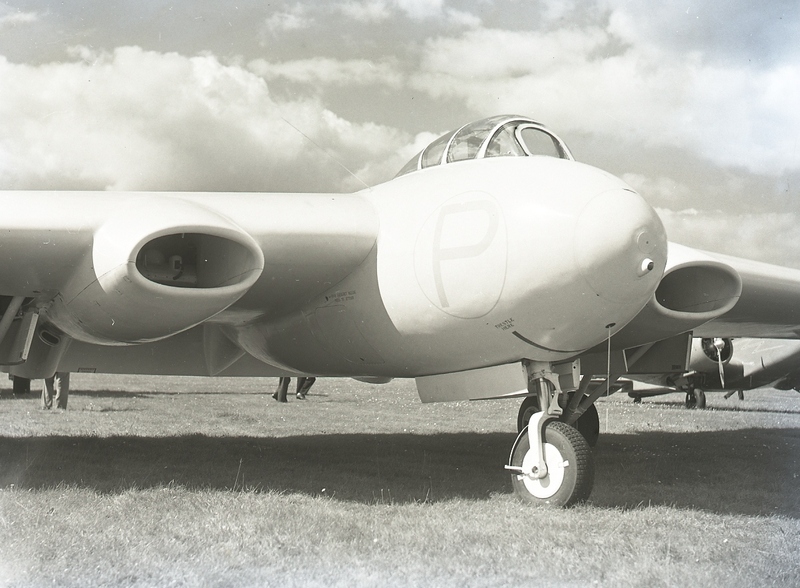 While it didn’t have all the advanced features of the two jet prototypes that would follow, the glider did include the brilliant, if complicated, automated pitch management system of ‘correctors’ placed between the main wing structure and the ‘controllers’ (as Armstrong Whitworth insisted on calling their elevons). The elevons themselves then had hinged servo tabs to help lighten the control loads. This complex system overcame one of the big problems facing flying wing designers – potentially lethal trim changes caused by the flaps, on an aircraft with such tightly coupled longitudinal forces. The correctors acted as large anti-servo tabs in front of the elevons. They were automatic, with manual augmentation for high power, flapped situations like a go-around. The control forces themselves were equalised by a balance plate which divided a pressure chamber in front of the correctors, so air pressure from the upper and lower wing surfaces would offset the pressure on the controls. These pressures continued to equal each other out, regardless of the aircraft’s speed. Most of a typically beautiful cutaway by Flight magazine (Dec 19, 1946). It shows the large, slotted Fowler flaps and snug Nene installation very well. So successful (i.e. 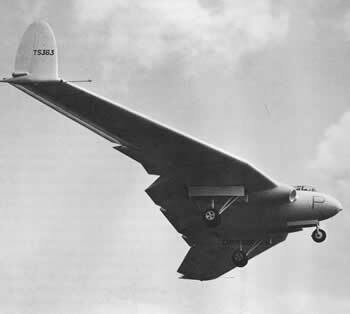 ‘as predicted’) were the glider trials, that work soon began on two upscaled and jet powered A.W.52 research aircraft, both with a 90-foot (27.43 m) wingspan and some 20,000 lbs take-off weight. 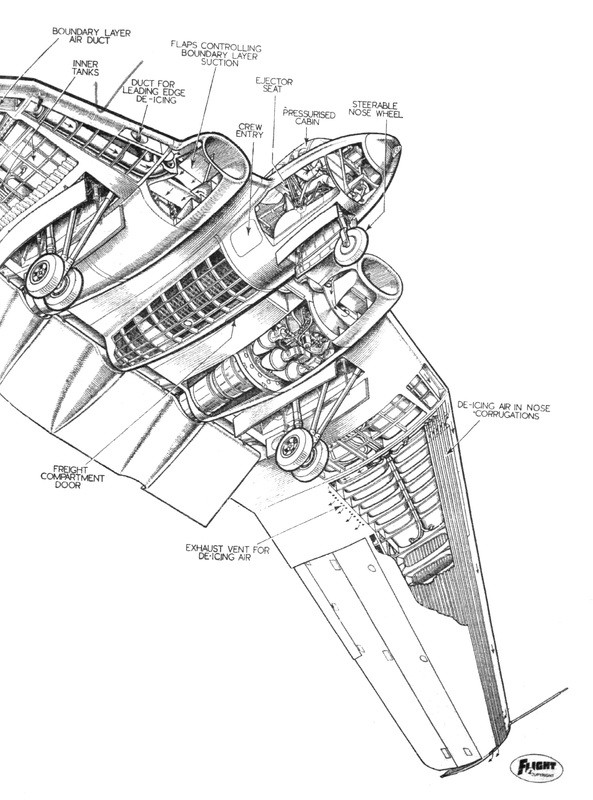 Although these were emphatically described as research-only prototypes, they did feature a generous cargo space behind the cockpit, a 34,150 lb MTOW, and were potentially envisaged as mail carriers. Both engines were centrifugal flow jets; axial flow jets would have fitted into the airfoil completely, however the technology just wasn’t advanced enough (in Britain, anyway) when the A.W.52 was being designed. The Derwent powered TS 368 would fly on September 1st, 1948. On December 16th, 1947, the A.W.52 was shown off to a large gathering of Government, industry and press representatives at RAF Bitteswell by Armstrong Whitworth’s chief test pilot, Squadron Leader Eric Franklin. A small but wonderful shot of TS 363 on approach to land. You’ll find a short video presentation on the A.W.52, including flight and taxi footage from the December 16th, 1947 ‘Press Day’, here. Squadron Leader Franklin was confident enough in the handling of his revolutionary craft to fly close formation with an Avro Lincoln after just 5 hours of test flying – allowing Flight magazine to share air-to-air shots in their issue of January 15th, 1948. 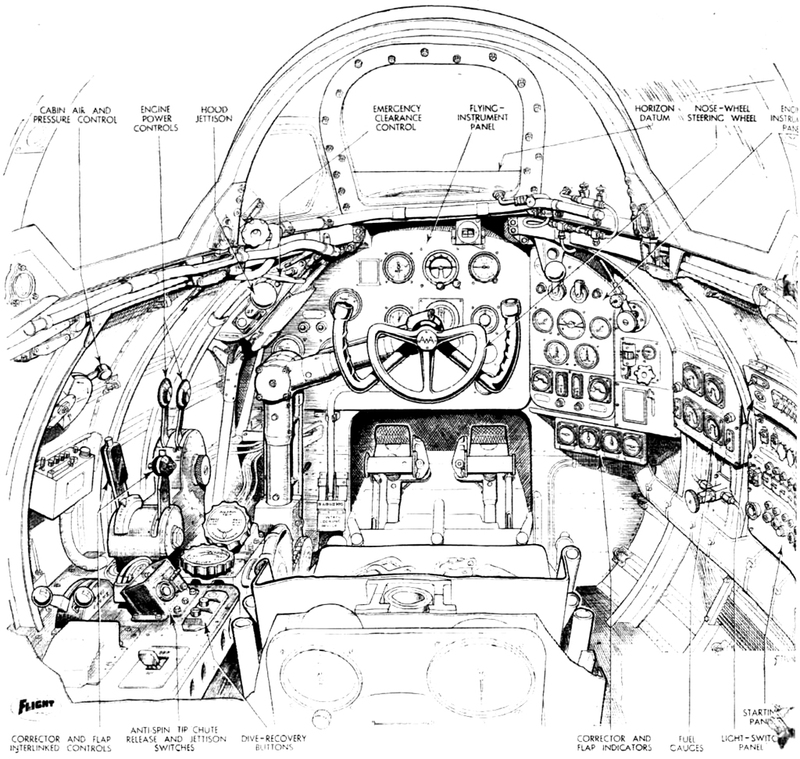 Flight magazine’s illustration of the A.W.52 cockpit, from the Jan 15, 1948 issue. Note the smaller wheel for nosewheel steering. However, the speed of that 250 mph low pass was telling. In what appeared to be a fairly typical development problem, the flying wing’s flutter speed was discovered to be lower than predicted and the prototype had been limited to a top speed of just 300 mph – far below it’s predicted performance of 500 mph (434 knots). The A.W.52 had revealed its Achilles Heel. The flutter problem may well have been connected to another major difficulty – maintaining, or rather achieving – the required laminar flow over the wings. Laminar flow was critical to the A.W.52 and no effort was spared to ensure a smooth and accurate wing surface. Rather than build up wings from spars and ribs, Armstrong Whitworth elected to craft expensive and extremely precise formers (female moulds, in other words, as used in the production of modern, high performance sailplane wings!) and fabricate the upper and lower surfaces separately. A stressed skin of alloy sheet was fixed to each former and a corrugated inner skin attached as stringers. Ribs were then attached to the corrugations. Using this technique, the A.W.52’s wing skins were produced with a contour accuracy within two-thousandths of an inch (0.051mm). So, while British test aircraft normally wore RAF roundels, the A.W.52 had none on account of the thickness of the paint! For all that, the expected laminar flow was not achieved and it may well have been that the resulting turbulent flow was exciting the flutter. On May 30th, 1949, test pilot J.O. ‘Joe’ Lancaster experienced an asymmetric elevon flutter while diving TS 363 at 320 mph (278 kts, 515 kph) – or Mach 0.9 estimated. The flutter rapidly increased in frequency and, expecting imminent structural failure, Lancaster ejected. 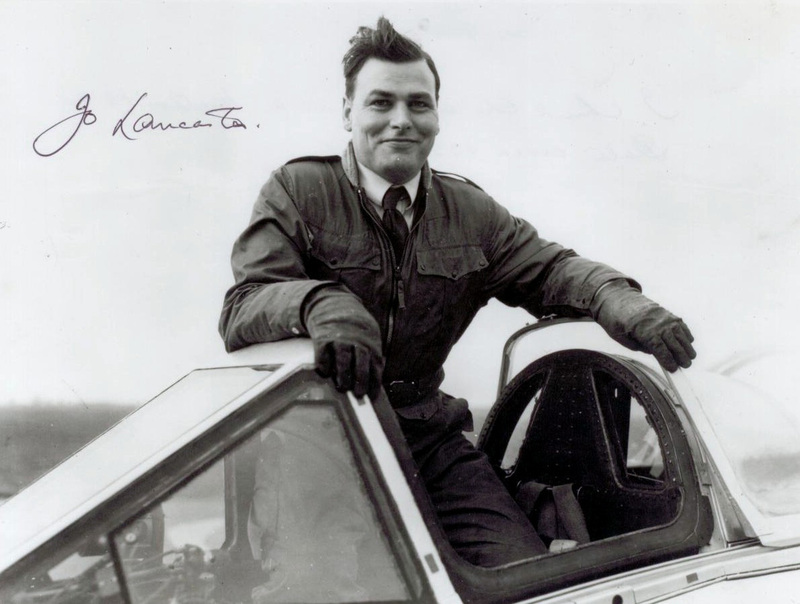 In doing so, he became the first British pilot to use an ejection seat (and a new A.W.52 technology that locked the controls forward and clear of his legs during the ejection) in an emergency. Test pilot Joe Lancaster, the first man to use an ejection seat in an emergency over Britain – unfortunately from an A.W.52. Following the loss of TS 363m the Derwent powered TS 368 continued to be used for increasingly infrequent flights with the Royal Aircraft Establishment at Farnborough, until September 1953. Then, sadly, it went the way of a large part of Britain’s innovative and dynamic aircraft industry through the 1950s and 60s. We can only speculate what later technologies – such as axial-flow jets, stiffer carbon fibre materials and supercritical airfoils, let alone flight control computers – might have done for the A.W.52. All but forgotten now, the aircraft was an early and brilliant highlight in Britain’s second golden age of flight. Hopefully, when commercial flying wings are the norm, history will treat the A.W.52 a little better. An A.W.52 heads a varied field of rather less-innovative British craft at Farnborough, 1948. Simply amazing. 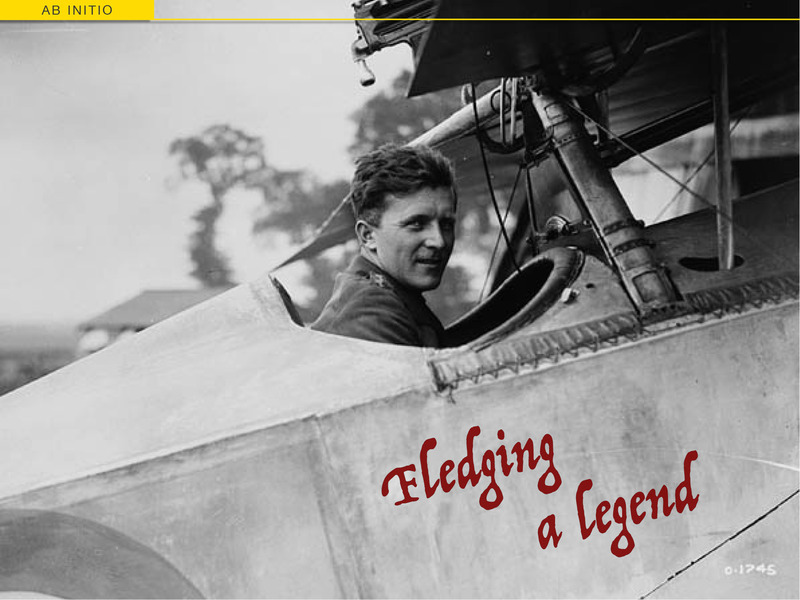 Thanks for another fascinating piece of aviation history that I probably would have gone my whole life without knowing. Far more refreshing than another story about some airliner Boeing or Airbus is building. What strikes me about this piece is how the Brits were on the cutting edge of aerospace technology and then… what happened? They just sort of fell by the wayside. I see that slowly happening to the U.S. if something doesn’t change. Am I the only one that feels that way? Oh ho! You’ve opened a an of worms there, Ron. And the subject of probably two posts for early next year. Britain’s aerospace decline was far and fast, from about 1956 – and the reasons are more complex than most people think. On the other hand, their current aerospace industry is back to #2 or #3 in the world, just in a very different form. I think the US could definitely learn from the past, rather than risking the same devastating mistakes.